Azazie has everything the fuller-figured bride is looking for in plus size collection. We want every bride to be able to find multiple dresses that reflect their personal style and help them achieve their dream wedding, which is why all of our designs are available in sizes 0-30, also offering custom sizing to give your curves a fabulous fit. 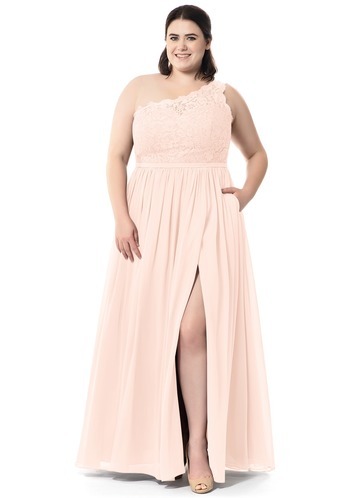 To meet the series of wedding needs, plus size collection for bridesmaids are available, too. Azazie offers multiple ball gowns to complement your personality. We have everything from mermaid to A-line dresses with full skirts and a defined waist, to dresses that are sleek and elegant. Many of the dresses feature beading and applique details through the bodice and waist to give the designs a unique touch. We also have sleek and modern sheath dresses that are perfect for brides who love looks with clean lines. For brides who have budget limits, we also provide you with our high-quality wedding gowns with low price for need. Also, Azazie provides kinds of floral bridesmaid dresses for brides who are searching for their dreamy bridesmaids, which look with delicate slits that are perfect for showcasing fabulous legs. Halter and V-neck in these designs are also available, which make these dresses the perfect choice for adding a little extra fun to fantastic looks. Azazie also offers intricate corset back dresses that are designed to cinch your waist and flatter every curve. We have a range of necklines such as sweethearts, illusions and V-necks that will highlight your bust to perfection. The sweetheart and V-neck will show more cleavage, while the illusion neckline gives you a bit more coverage without making you feel too covered up. With our versatile range of designs, you will be able to find the dress that showcases your figure and fits your style.